Happy Thursday! With all of the snow we've had piling up in Kansas City, it has been a l-o-n-g week stuck inside. Wasn't it just a couple of weeks ago we were all outside playing? I'm excited to see what you have been up to, and maybe glean a little inspiration from it for the coming week. I have four toddlers who need some new entertainment! If you remember back a few weeks ago, I posted that Ellie is a master at putting on her siblings' socks. Over the weekend, she found Daddy's socks and thought they belonged on her feet too. She (incredibly enough!) pulled them all the way up to her knees and then wore them around the house and through dinner time...because that's what you do with socks. You wear them. Ha! 2. The Kansas City Star! Every so often, the KC Star checks in with us to see how we are doing. They did a huge write up and photo spread for the kids' 2nd Birthday! This is a screen shot of how it looked on the web...the actual newspaper article was even cooler! If you haven't had a chance to read the article and look at their photo gallery, feel free to jump over and check it out! Believe it or not, there is actually a car underneath that pile of branches in the first photo. Last week, we had a major snowstorm. This week, we had a second huge snow storm, and this one took out lots and lots of tree branches. Sean has decided he needs a chainsaw to clean up the mess in our yard...and I've reluctantly agreed that that is probably the best method. I wonder how much more snow we will get before our first heat wave of 2013? Money Saving Mom picked up one of my articles and ran it over the weekend. Holy moley. It was insanely exciting to have the honor of being posted on her site! Please take a moment to read the article I wrote called "How I Save Money While Rarely Leaving the House." There is some good info in there if you don't get out much and still want to cut costs. And if you are new to A Beautiful Ruckus either through Money Saving Mom or another source, I'm so glad that you are here! I hope you will stay awhile and introduce yourself! It's a pleasure having you in our little section of the blogging world! Oh goodness, what am I going to do with this kid? I know I posted this photo yesterday, but I can't help including it in my Little Things Thursday post. This photo makes me laugh every single time I see it! 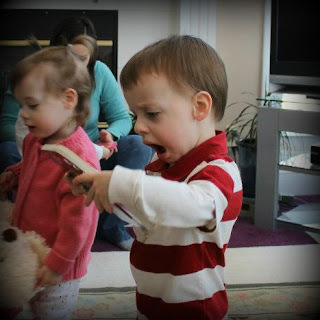 My brother snapped it at the kids' birthday party when Elijah opened a gift. Apparently, that's the best book that has ever been written, and he got his very own copy. I hope he never stops being so hilarious! Elijah's expression in that last photo is totally hilarious! Love the socks! And hey you need them for the all the snow! Good point! They will keep her warm! I gotta know...what book is it? Love the expression. I'm honestly not entirely sure what the book is because of how he is holding it. I think it's an alphabet book? Ellie's socks are a riot! That amount of snow is crazy!!!! We get a few inches in Texas and everything closes for a few days. I will be checking out the money saving mom blog, sounds fantastic! I'm from southern New Mexico so I totally get where you are coming from. I don't do snow and ice at all. I don't drive for days after a snowstorm! New follower from the Harvest of Friends Weekend Blog Hop. Wow...four at once! Now that IS a beautiful ruckus! Aw, thanks! I love it when I get a positive response to my little guys! Too often it's the opposite. You've made me smile! Thank you!